A few years ago, Josh Jones was your typical Kennedy High School student – a guy who loved hanging out with friends, running cross-country, playing video games and trying to meet girls. 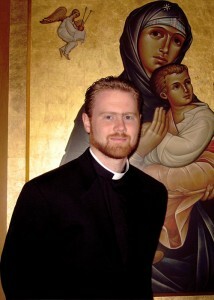 Jones, who moved to Mount Angel when he was 10, said his call to the priesthood came after his college graduation in 2005. With a major in computer science and a minor in math, he wasn’t sure what career path to take, so he opted for graduate school and was accepted into a doctoral program in computer science at the University of Idaho. But his life unexpectedly changed before he even began grad school. “The call first came right after I graduated from the University of Portland,” Jones recalled. “I had been active in my faith for a number of years already but had never felt terribly interested in seminary … It was the summer after graduation when something started moving. There was a series of events in my life that really started awakening me to something greater than living for myself and trying to make money. I felt this strange yearning to discover what that is. During his first semester in graduate school Jones did “a lot of prayer and reflection” about his life. He began to realize the times he felt most alive were when he was at the local parish or praying with a group of people in the chapel. His computer science studies began to feel more and more like a secondary pursuit. An email “out of the blue” from one of the Franciscan priests he knew prompted Jones to ponder how he probably wouldn’t receive a sign from God telling him which path to take and to consider that there is the element of free will in his choice. After prayer and reflection, he decided he wanted to move into an active “discernment process” to see if he was being called to the priesthood. Normally, a college graduate entering the seminary would have a seven-year program to complete before ordination. Two years of “pre-theology,” emphasizing philosophy courses, precede two years of theology study, followed by a year of pastoral work in a parish or other ministry setting, and then two more years of theology. Since he had taken several philosophy and theology courses in college, one year of required pre-theology courses was waived for Jones, making his program six years long. While the seminary’s academic program is daunting, Jones said it is only one component of the “Four Pillars of Formation” that “form” future priest-pastors. The other three pillars are spiritual, pastoral and human. Spiritual development comes through common and individual prayer, daily Mass and private devotions. The “pastoral pillar” involves developing people skills and gaining experience working in ministry settings, while the “human pillar” refers to becoming a healthy, mature adult man.